Is 866 a Toll Free Number? Yes, Here's What You Need to Know. Is 866 a toll free number? Yes, and here’s everything you need to know. Update 2017: We often get questions like: Is 866 a toll free number? 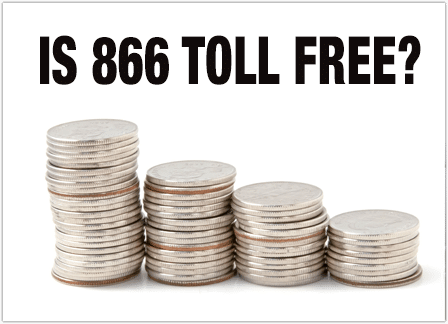 or Is 866 toll free in the same way that good-old-fashioned 800 toll free numbers are? Well, the answer is yes! All 866 telephone numbers are 866 toll free numbers. And to answer the question, is 866 toll free to callers? The answer is, agian, yes. When callers call an 866 toll free phone number the call is toll free. All 866 numbers work exactly like toll free numbers with the prefix 800. If you are interested in getting an 866 number you can use the UniTel Voice toll free number search tool to find the perfect 866 toll free number for your small business. Just click the “Get a Toll Free Number” button below to get started. 1. Are 866 numbers toll free or are they different than 800 toll free numbers? An 866 telephone number is not different than an 800 toll free number. The FCC released the toll free number prefix 866 for businesses to use because there was a shortage of 800 numbers which were mostly all in use by existing companies. Today, even 866 numbers are running low but you can still find a great toll free number in 855, 844, and 833 if you cannot find the perfect 866 number for your business. 2. Do 866 numbers have the same FCC portability rules as 800 numbers? All 866 phone numbers work the same way as traditional 800 numbers sold to businesses every day. Toll free telephone numbers with the prefix 866 have the same portability as all other toll free phone numbers. When you purchase an 866 number you own that number and can transfer it to any phone company of your choice. They have the same portability protection as traditional 800 numbers do. 3. Do 866 numbers give your business the same credibility as having a true 800 number? Sure! Although it is true that 800 is the most recognized toll free number prefix 866 numbers have been around for a long time and are widely used by small and big businesses alike. Fortune 100 companies use them even the tv show “Dancing with the Stars” used and 866 number. All toll free 866 numbers work the same as 1800 phone numbers. An 866 telephone number gives your business the same kind of nationwide presence and credibility as having a traditional 1-800 number.